Ok, I have teased a lot of you with photos of my new Christmas invention but haven’t had time to share the recipe. After getting some great feedback from my lovely craft group I thought I had better get on and get this posted! I am busy sorting out the final details of our local Coeliac UK support group kids Christmas party so won’t waffle on. I heard that sigh of relief! 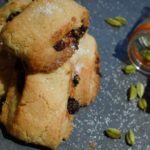 If you would like to make my easy clementine and Cointreau mincemeat to put in these then you will find the recipe by clicking here. If you would like to see me making pastry and preventing it sticking on the surface (much like you need to do with this recipe) then you can watch that here. Flour a large piece of baking parchment and roll the dough (with a floured rolling pin) out into a rectangle, about 20cm long by 15cm wide, making sure not to roll it too thin and checking all the time that you can still move it on the surface! Watch the video of me making pastry if you are not sure what I am talking about here! Place on a greased baking tray and cook in a pre-heated oven at 200 degrees (180 degree for a fan oven) for 10-15 minutes until golden. 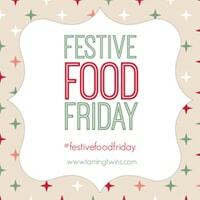 « Win A Gluten-free, Wheat-free Christmas Hamper! Oh yeah! And the cardamom and chocolate makes it taste incredible!! Thanks Julie. They flew out the house! How unusual, I bet these tastes awesome! 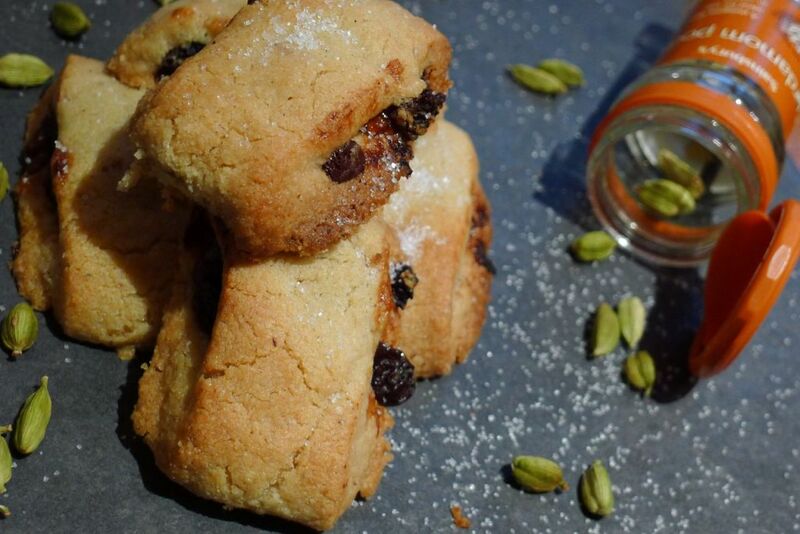 I love cardamom with dried fruits! I like being unusual!!! Cardamom and chocolate is amazing. I like to make things that you can’t buy! 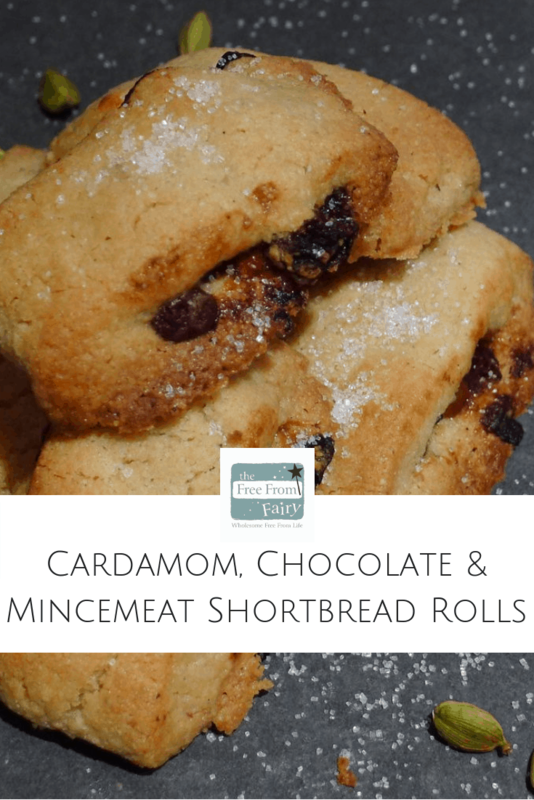 Your shortbread and mincemeat rolls sounds like a great treat for Christmas parties! Oh yes, they would be lovely for a party. I like to create things that are a bit different from what you can buy! Thanks Sarah! Oh yes, a world of possibilities. Since we can’t have fig rolls I plan to create some in the same way next! 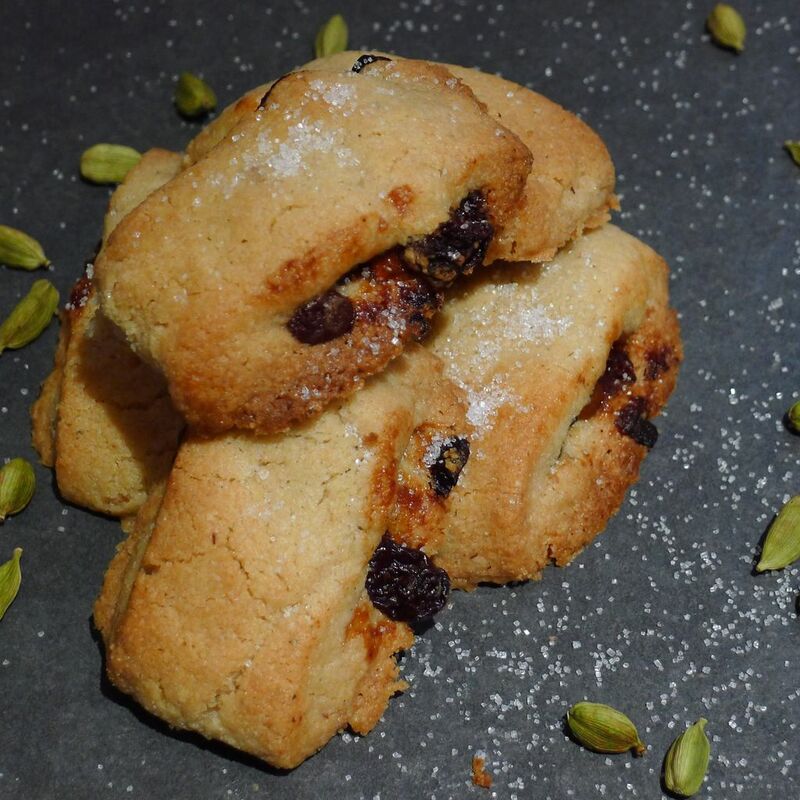 I am so happy to find that you can put Cardamom into more xmas goodies, and I cant wait to try out these stuffed cardamom shortbreads. Let me know if you do try them! I am going to have to make another batch once I have made more mincemeat because they were very popular! These sound fab Vicki, well done! Ah thanks Renee. I guess they are off limits to you? How will you do Christmas on GAPS? Sounds yum Vicki. I am well impressed that you have a coeliac group kids Xmas party! I tried dismally to get our local group interested in making the group more child-friendly, but it was full of a group of cliquy older people who seemed to be only interested in cream teas and coffee mornings for grown ups. Oh dear Kate! To be honest it wasn’t well attended, but the 14 kids that did come had a great time and so did I!!! mmm…I need to make some more!